The beauty of blank spaces. I’m not a blank spaces kind of girl. I like to see those spaces used for their purpose. 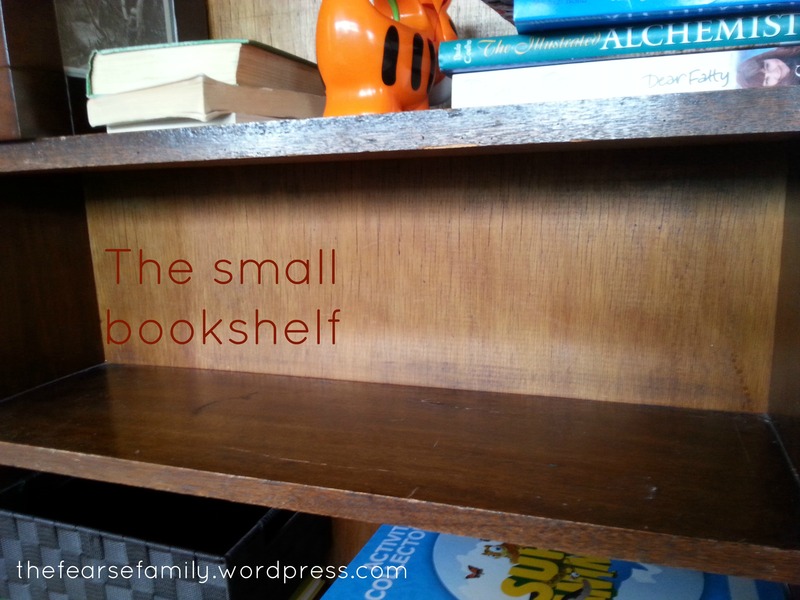 Bookshelves full to overflowing with interesting books and drawers full of pretty clothes and knickknack shelves full of (preferably vintage) thingies.Over the past two years I have learnt to love blank spaces. They show me that I have made progress. By leaving them blank they incite my imagination. All the things I could do with that space, the way I could curate it or fill it with stuff I love. And being able to imagine is enough. Here are some of the blank spaces I have cultivated since we began our BNN year. Even though they are spaces filled with nothing, I sometimes think this is my biggest Buy Nothing achievement. Currently I am piloting an e-course for Bethany of Our Journey to Ithaca (which I will look forward to recommending to you when it’s up and running. The e-course runs alongside reading the e-book Clutterfree by Leo Babauta and Courtney Carver (full disclosure: I purchased this – but education is something I’m always willing to invest in). I haven’t read enough of the book yet to recommend it, but so far it reconfirms a lot of the things I have already learned about living a less clutter-some life, and also reminds me of some home truths I choose to forget sometimes. This quote, which I read today, is particularly relevant to this post: When you have emptiness in your home you have space to fill it with conversation, play, laughter, and silence. I’d love to hear your tales of blank spaces! Share photos! It’s been three months since we updated you on the clutter wars. Looking back makes me realise how far we have come. 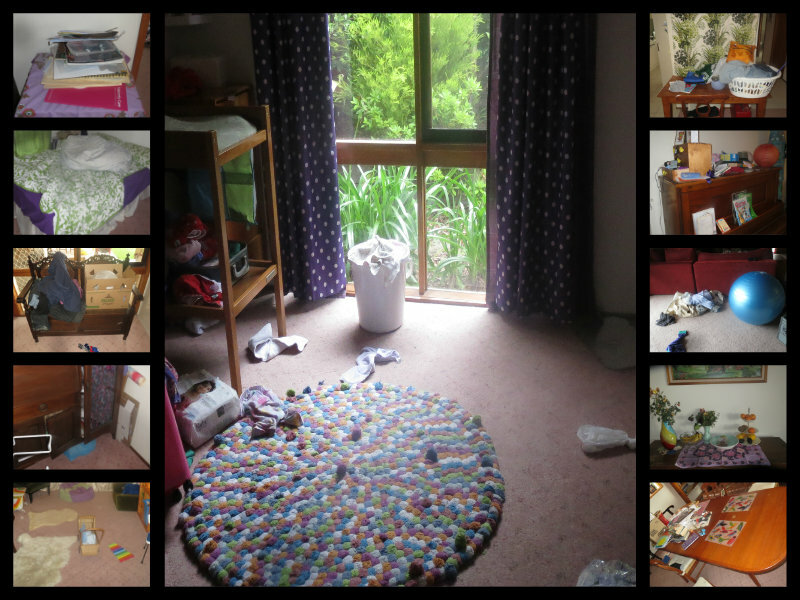 We still have a clutter problem, but we seem to be getting some of it under control (I use the term ‘control’ loosely). Remember our first clutter collage? We were in real strife then. We didn’t even have a toddler-nado yet. We just had too much stuff. There is no other reason for it. Less than a month later we had already made progress. Every time I do an update I can see at least one area that I know, right away, how to improve. 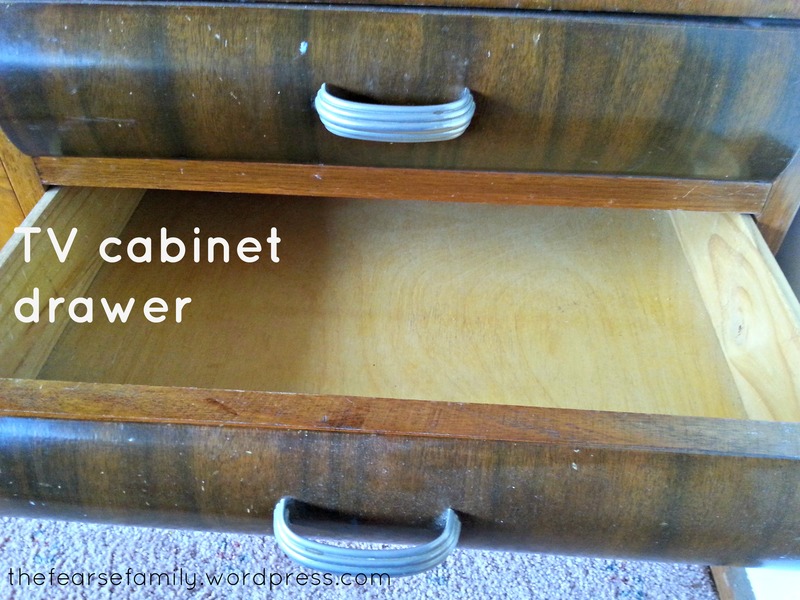 The biggest improvements here were around my corner desk and with Little Fearse’s areas. 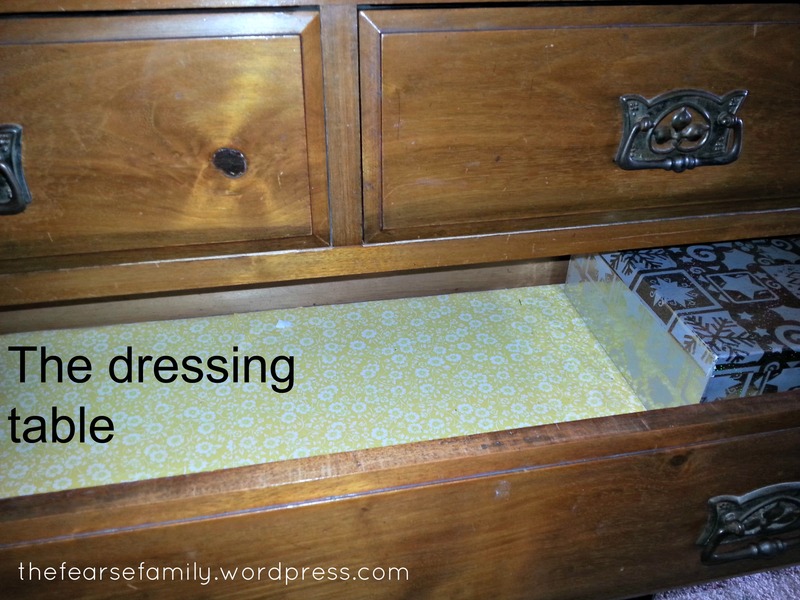 I had started to get rid of things with the 2-4-1 challenge and making room in cupboards and drawers for things I had decided to keep. It was a while between updates then, and through those four and half months we learned a lot. We removed some trouble furniture, we started using spaces for their purposes. We had removed many many many more things from our home and our lives. Some areas are still in trouble. Some are reverting. Others have maintained their approximate state since July and others have improved. The things I’m really concerned about are the areas that are reverting. The hall seat has become a one-stop-clutter-spot lately, as has the kitchen table. The top of the piano is still a nightmare, despite getting rid of the huge old non-working portable record player at our recent garage sale. The laundry basket on the sewing table is the result of a recent clutter bust of the living room. 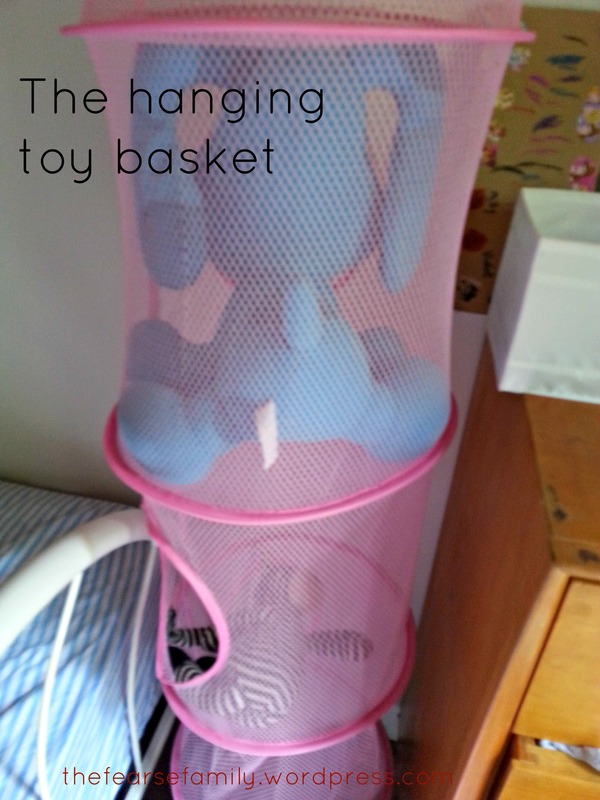 Only useful if you then put everything away, rather than leaving it in the basket to lie around for another week or two. The buffet has now become home to our fruit (and a few vases of dead flowers which I would have removed before taking the photo, but thought it wouldn’t be true to showing what our real home looks like). I have been really strict, mainly on myself, about not allowing anything else to touch down on this space. The only issue I see with this set up is that Little Fearse can now reach the top. We regularly find pieces of fruit in the bowls with one bite out of them. Last week I cracked it (quietly) when Little Fearse refused to help me clean up her toys. I put all of them away and left only some books, a few instruments, a kettle, one teddy and some blocks. Her area looks great and you know what? She isn’t missing any of that stuff at all! Neither am I! The main thing that is hampering our current efforts is Little Fearse. 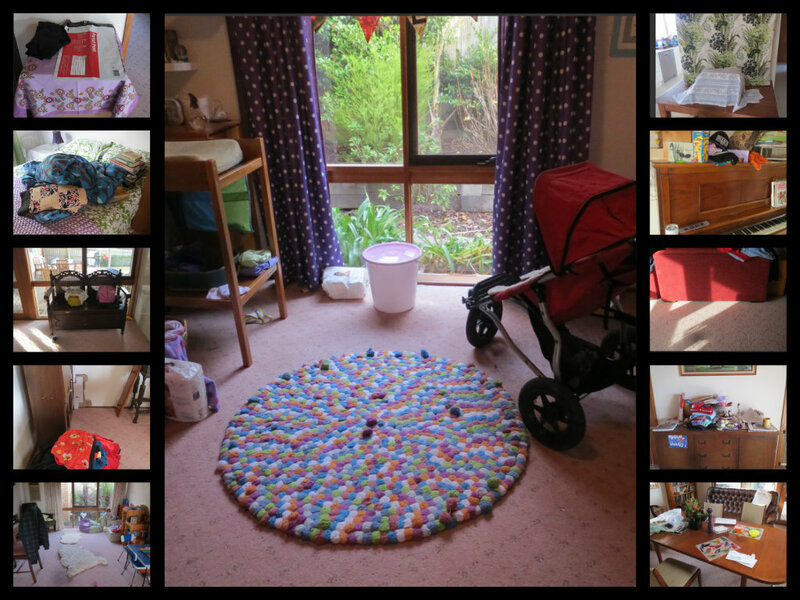 She’s just a whirlwind lately and no matter how often we tidy it takes her less than an hour to have it looking like we never lifted a finger. She is sometimes willing to help pack up but other times she will sit tight and just refuse. (Even worse, she will sometimes react to us asking her to help clean up by pulling even more things out and off shelves…yep, she’s getting closer to 2!) Tidying up after a toddler 4 or 5 times a day doesn’t fit into my idea of a simple life. You’ll notice from the top of the piano that I have yet to bring in the cupboard for storing things to return to others. I have an antique coal shoot that I need to do some minor repairs on, and then oil. I think it’ll be perfect once I get around to tidying it up. Also, our dining table is absolutely strewn with crap. This is one of the last places we can put things out of Little Fearse’s reach. 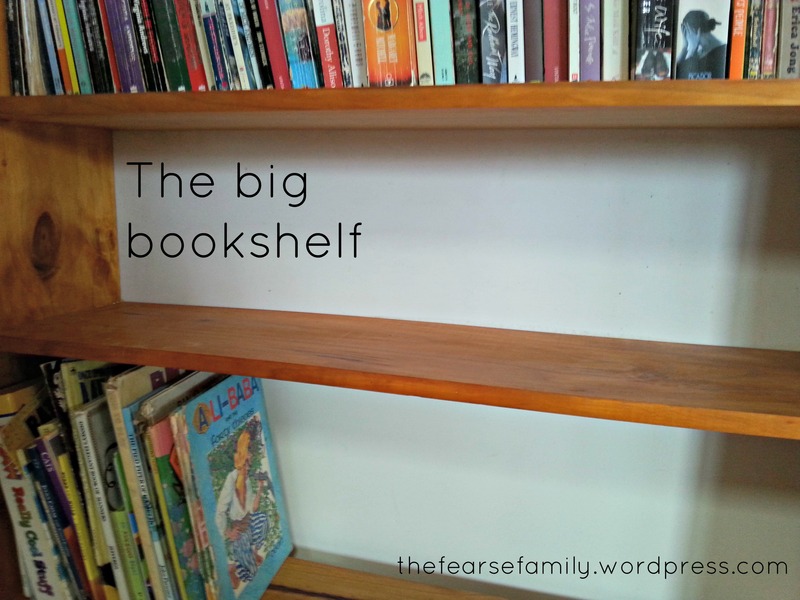 It is currently housing all books that need repairing (I call this our book hospital) and a variety of other things we want out of her reach. We still use half the table for breakfast and dinner every day, but the other end is getting a little out of hand. So, any tips on how to combat the last of our clutter issues? 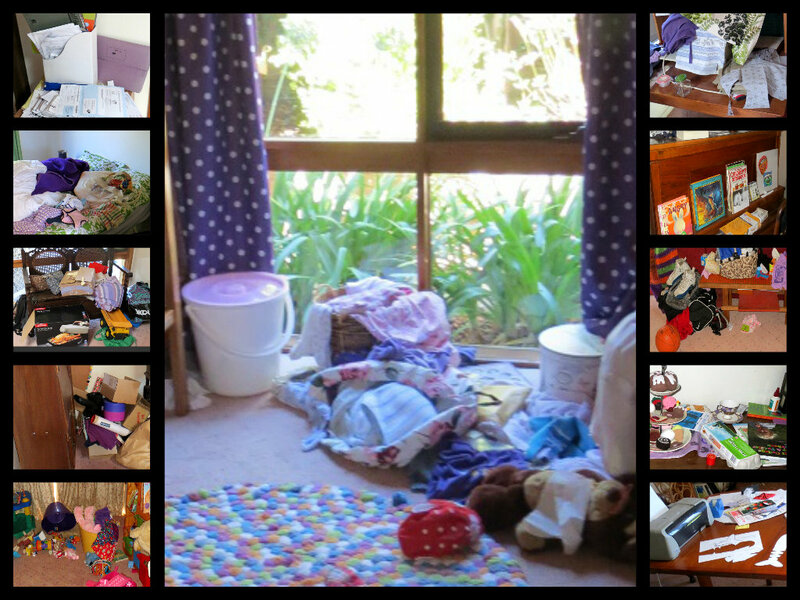 As promised on our FB page here is our long overdue update to the original Clutter Collage (one and two). On first glance we haven’t learnt a lot since the last update, but the more I consider these photos the more I realise we probably have learnt. Any spaces that are higher than Little Fearse’s reach will become cluttered. We just need to focus on decluttering them more regularly. That’s why these spaces have reverted back so easily. 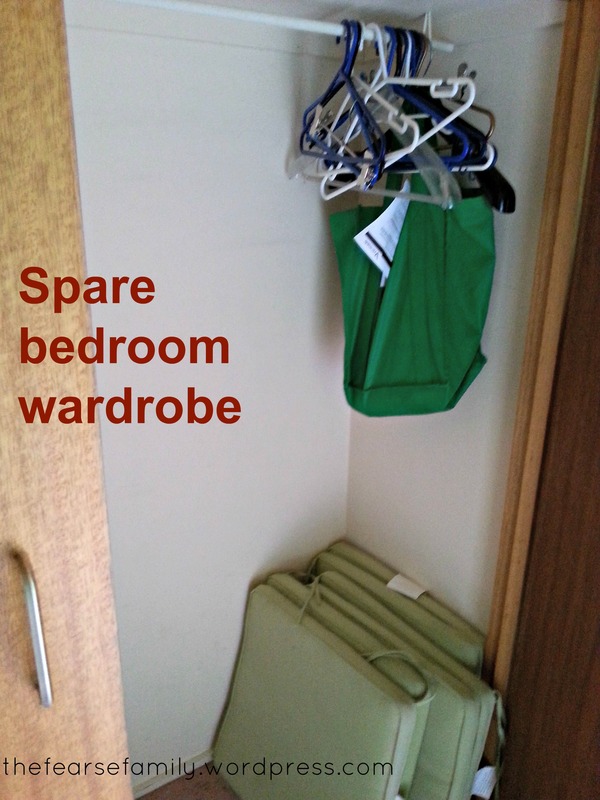 Although the spare bedroom is a good place to hide stuff when people visit, keeping the bed made and ready to go makes it a lot easier to clear this when people come to stay over. Little Fearse’s bedroom is looking a lot better. I’ve tried hard to stick to my promises there. The top of the piano is where we keep things we need to return to people or that we’re passing on to people. We have become used to checking it before we go to visit anyone. 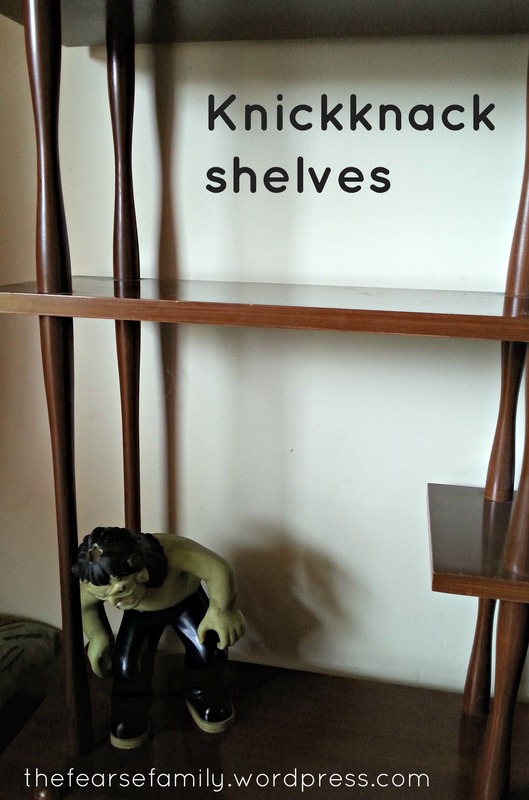 I have come to the conclusion that if we can find a spot for a small cupboard to house these things (and get used to looking there instead) it will solve this clutter space issue and hide all that stuff away. I’m a little concerned about the stuff I’ve put aside to sell on eBay. You can see it creeping into the fourth photo down on the left. The pile just grows and grows and I never quite find the time (read: motivation) to list it. Perhaps I just need to let this stuff go. The sewing area is looking much better because I’ve been using it for its purpose! 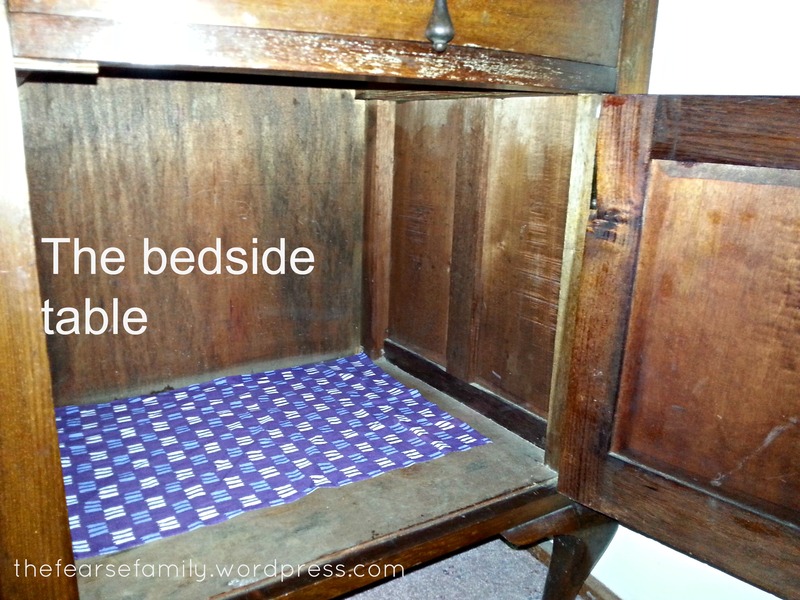 It is also for this reason that the bench seat is looking better – I’ve been doing the mending. Some of the things that I mended this week can be seen on the bench seat in the first entry from February. I clearly need to do my mending more often. In the third photo down on the right you will notice the table that was previously there has now been removed. I initially took it out because Little Fearse started climbing it, but I’ve been pleasantly surprised to find that this space is no longer a clutter magnet. Sometimes just removing the furniture helps! 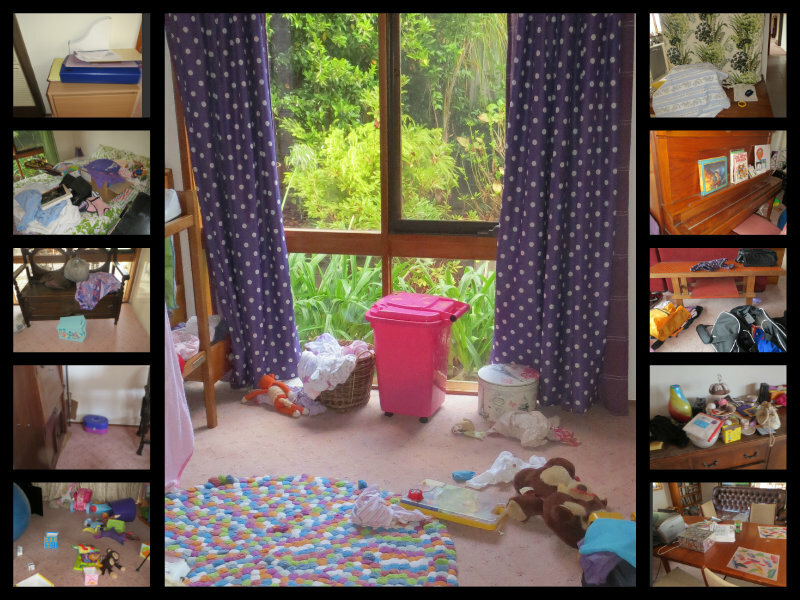 Little Fearse’s play area (last image on the left) is so much better since we put away 90% of her toys. She also has more focused play times and we have less mess to clean up at the end of the day. I think it’s been a win-win situation for all of us – we all enjoy that space more. We’ve still got a long way to go, but I feel like we’re closer. Will we be there by the end of our BNN year? Who knows? This series of three short videos looks at modern day homes from an archaeological perspective. The results are fascinating. These videos advertise a book which I hope to find at our local library some time this year. Something has to give, right?